Be the first to share your favorite memory, photo or story of Dr. Forrest. This memorial page is dedicated for family, friends and future generations to celebrate the life of their loved one. 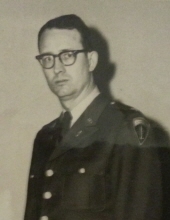 Dr. Forrest Glenn Tompkins, age 87, passed away Thursday, September 27, 2018, at Ben Atchley State Veterans Home in Knoxville. Dr. Tompkins is a retired Colonel with the US Army, where he served with the Medical Corp. He was an OBGYN in Knoxville for many years, retiring from his private practice in 1992. He was preceded in death by his parents, Roy and Marion Tompkins; and his brother, Robert Tompkins. Dr. Tompkins is survived by his daughters, Kathryn Prasad, Kristen Brooks, and Karen Foster; sister, Sandra Tompkins; his 6 grandchildren; and many life-long friends. Graveside service will be held 2pm on October 11, 2018, at East Tennessee State Veterans Cemetery (2200 E. Gov John Sevier Hwy) with full military honors conferred by the US Army. In lieu of flowers, memorials may be made to St. Jude Children’s Hospital (stjude.org) or Habitat for Humanity (knoxvillehabitatforhumanity.com). To send flowers or a remembrance gift to the family of Dr. Forrest Glenn Tompkins, please visit our Tribute Store. "Email Address" would like to share the life celebration of Dr. Forrest Glenn Tompkins. Click on the "link" to go to share a favorite memory or leave a condolence message for the family.